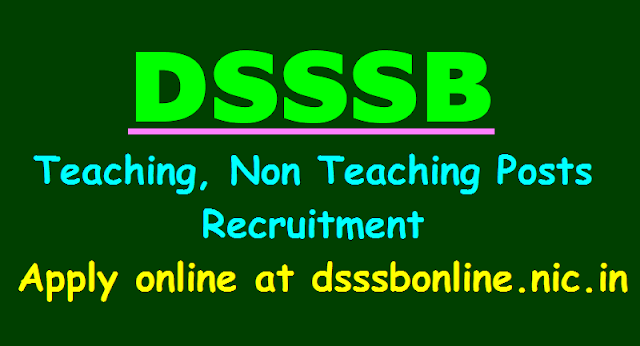 DSSSB Recruitment 9,232 Teaching & Non Teaching Posts Recruitment 2018, DSSSB Teaching, Non Teaching Posts Recruitment 2018, Apply online at dsssbonline.nic.in, DSSSB Teachers Recruitment. Delhi Subordinate Services Selection Board (DSSSB) has announced a notification for the recruitment of Teaching & Non Teaching vacancies on regular basis. Delhi Subordinate Services Selection Board (DSSSB) has invited online applications from eligible candidates for recruitment to more than 9000 vacancies under Directorate of Education Govt. of NCT of Delhi. Candidates can start applying for the posts from 5 January 2018 till 31 January 2018. DSSSB will conduct examination in Delhi only and candidates must carry Aadhaar Card to the examination centre, failing which they shall not be allowed to appear for the examination. Details of the recruitment can be found at the official website delhi.gov.in. Online applications can be submitted at dsssbonline.nic.in. Qualification: Graduation with B.Ed. (Special Education) or B.Ed. with two years Diploma in Special Education or (c) Post Graduate Professional Diploma in Special Education/ any other equivalent qualification. Qualification: Senior Secondary School (Class Twelve) certificate or Intermediate or its equivalent, Diploma/ Certificate in Nursery Teacher Education programme & have passed Hindi at Secondary Level. Qualification: Senior Secondary (or its equivalent), Diploma in elementary education/ Bachelor of elementary education (B.El.Ed).Senior Secondary (or its equivalent) with 50% marks and 2-years Diploma in Education (special education)/ Graduation and 2 years Diploma in elementary education, have passed Hindi or Urdu or Punjabi or English as a subject at Secondary Level. Qualification: Graduate with Bachelor’s of Physical Education (B.P.Ed.) or its equivalent. Qualification: Diploma in Drawing/ Painting/ Sculpture/ Graphic Art/ Master’s Degree in Drawing and Painting/ Fine Art/ Bachelor’s Degree in Drawing/ Painting/ Fine Art, Diploma in Painting/ Fine Art. Qualification: Master’s Degree in the subject concerned from any recognized University. Degree/Diploma in training /Education. Qualification: A Bachelor’s Degree (Honours/Pass). Should have qualified CTET from CBSE. Qualification: B.E. or B. Tech. (Computer Science/IT)/ M.Tech. (Computer Science/IT). or M.Sc. (Computer Science)/MCA. Selection Method: The selection shall be made through One Tier and Two Tier examination scheme and Skill Test wherever applicable. There is no provision of re-evaluation/re-checking of Answer Sheets/Answer Scripts in respect of the examinations conducted by DSSSB,' clarifies the Board, as well. For the second tier exam, candidates will be called 6-10 times the actual number of vacancies. 'In Two Tier examinations, Tier I exam to be used for short listing only. Selection will be made on the basis of marks obtains in Tier II Examination.' Candidates should note that aadhaar card is mandatory to appear for the exam. Last Date to Apply Online: 31.01.2018.